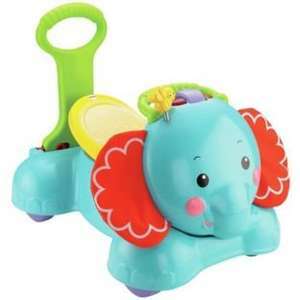 Adorable elephant friend with lights, music, fun sounds and three grow-with-me ways to play gets baby moving: first bouncing up & down; then steadying baby's first steps as a walker; then as a baby-powered ride-on pal! Lively music, colourful lights, and fun sounds encourage and reward baby's actions. The elephants big, soft ears move as baby moves-and the wobbly bumblebee, bat-at rollerball with rattle-bead sounds and two light-up buttons add even more fun and excitement! Batteries required: 2 x AAA (included) plus .